I must admit it’s tiring to work anywhere in Metro Manila's central business districts (CBDs), especially when you commute every day from nearby provinces like Bulacan. You have to wake up early, making sure not to be caught in the morning heavy traffic, allotting another one hour to your travel time for the long queue [and sometimes unexpected (or expected) glitches] of MRT, or going through the three-hour bus ride from SM North EDSA to Makati City via “the-always-traffic-prone” EDSA. Yes, it’s very tiring working in CBDs, but I have found a place that will change the way you see the busy metropolis. Not so far from Quezon City, there’s this mountain -- called Mt. Balagbag -- situated in the boundaries of Rodriguez (formerly Montalban), Rizal and San Jose Del Monte City, Bulacan. Mt. Balagbag is the answer to some of my bucket lists: overlooking city lights and lying on grassland while gazing at the open skies and waiting for shooting stars. Of course, I was able to do one of my physical activities -- hiking -- in Mt. Balagbag. At first, I had second thoughts of hiking along Mt. Balagbag because of security issues I’ve read from the Internet. They said the mountain harbored armed groups and there were encounters sometimes between them and the military forces. But I really want to go to this mountain because I haven’t found any mountains that can offer a view overlooking the city lights. I must attest that people living in the area are very nice: one of the nicest communities I encountered so far in my entire adventures of climbing mountains. They’ll be the one to greet you with their genuine smiles. The 777-meter-above-sea-level (MASL) Mt. 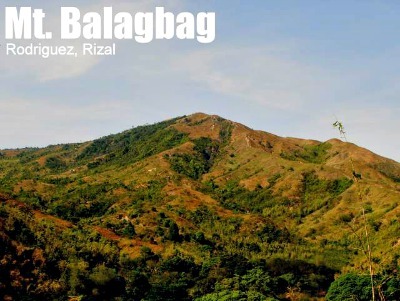 Balagbag is not only a good place for hiking, camping, city lights overlooking, and star gazing. This is also a good spot for cycling and motorbike activities. Tough cars can also get into the summit -- imagine how friendly the terrain of this mountain is, especially to those who are just hiking -- perfect for family bonding and camping. Day hike is also good but I suggest that if you want to try this mountain, make it an overnight activity for you to witness the Miss-Saigon-like sunset, dazzling city lights, star gazing, waiting for shooting stars, and the great view during sunrise. Here’s how to get to Mt. Balagbag: Ride a bus bound for SM Fairview-Tungko (make sure that it will go up to Tungko and not just at SM Fairview), then alight at Jollibee Tungko. At the back of Banco de Oro (BDO) in Tungko, there is a jeepney terminal going to Licao-Licao; ride that jeep and from Licao-Licao, you may start your trek up to the summit or you may wish to ride a tricycle going to the registration area which is actually a 30-minute walk from Licao-Licao. But if you’re coming from Bulacan, especially from Meycauayan City or Marilao and other nearby towns and cities, it’s best to take a passenger jeep going to Muzon from Tabing-Ilog wet market or at SM Marilao. From Muzon, ride another jeep going to Tungko Jollibee, then take a jeep to Licao-Licao. It will cut your travel time by about an hour. Budget needed? Less than PhP500. So what we did in our escapade was we met at McDonald’s Cubao near the MRT Cubao Station at 2 p.m. We arrived at Licao-Licao at around 5 p.m. We walked for 30 minutes going to the registration area than riding a tricycle which only costs PhP20 per head. Then we started our assault on the summit from 5:30 p.m. and reached the top in a slow pace with lots of rest and photo opportunities. Some in our group had finished the trek at around 7:30 p.m. but some (including me) got on the peak at 9 p.m. as we cooked our dinner in the second registration area, 15 to 30 minutes away from the summit. And I was so happy to have stopped at the second registration area and met the infamous cat of Mt. Balagbag which hikers believed as the guard of the mountain. He’s so adorable and sweet and charismatic! So after our dinner, we had a picture taking session with the city lights in the background. Be ready to be amazed with the city lights of CBDs of Ortigas, Bonifacio Global City, Makati, Quezon City, and Manila. Lucky, like us, if you’ll catch a fireworks show. At about 11 p.m. when we decided to go to our tents, my “tent-mates” and I stayed awake for an hour and cherished the open skies; lying down on the grassland and gazing at to stars. The universe was on our side since it was a bright night, letting us saw billions of stars and four shooting stars with our naked eyes. We woke up past 5 a.m. to wait for the sunrise. And that scenery was really worth the wait.